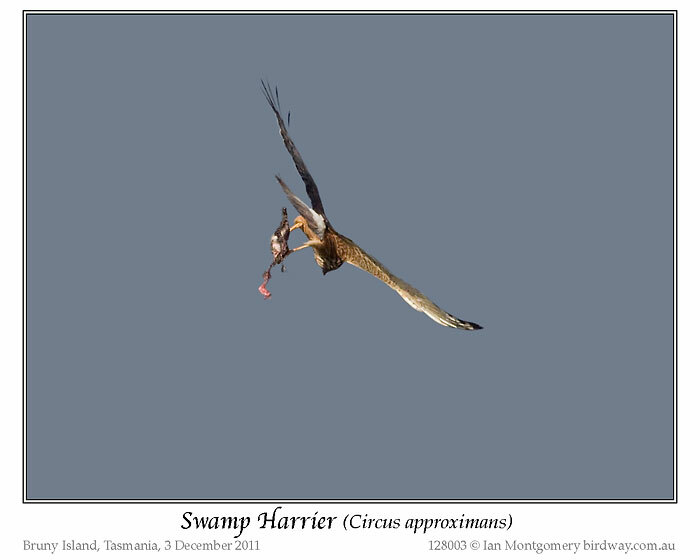 Recently I was having trouble finding a reasonable photo of a Swamp Harrier for Where to Find Birds in Northeastern Queensland, when I remembered an encounter that I had with this one on a beach on Bruny Island in Southeastern Tasmania in late 2011. At the time, I was on the return leg of the trip to the Sub-Antarctic Islands via New Zealand and the Harrier photos got neglected in the excitement of posting penguin, petrel, prion and parakeet photos (not to mention albatrosses but they spoil the alliteration). The encounter was the enactment of a minor natural tragedy that was sad to observe, and that may be a subconscious reason for the neglect. I’d actually photographed the bird first photo two minutes earlier struggling to fly into the teeth of a southerly gale and carrying an item of prey, that I couldn’t identify. The Harrier dropped it, back off to leeward and made another unsuccessful attempt to fly up-wind by flying low over the sea on the other side of me. This attempt failed too, and the bird came back for another try flying more or less overhead. At that point, it was attacked by a very distraught-looking Pied Oystercatcher looking for all the world as if it was on a retaliatory bombing raid. The Oystercatcher made a couple of passes at the Harrier, which eventually gave up the struggle and flew inland across the prevailing wind. I could only assume that the item of prey was the Oystercatcher’s chick and the field guide confirmed that these look like plover chicks, camouflaged speckled brown with white bellies. 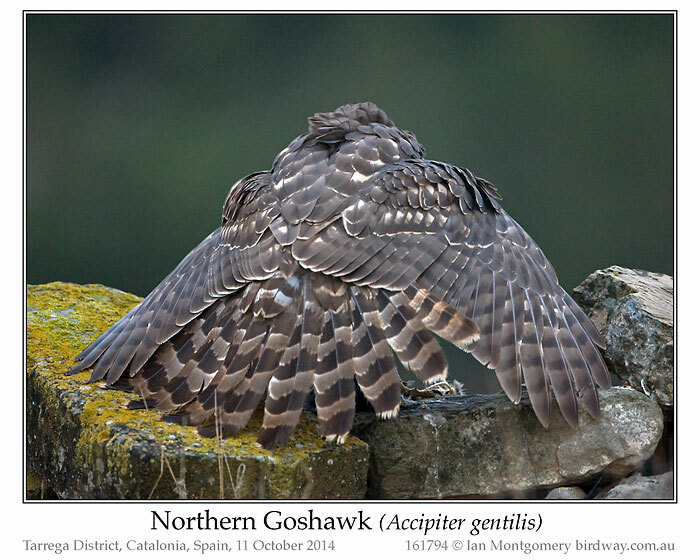 Predation is a natural part of life, but it was sad that the chick died for no purpose. I’ve found Harriers difficult to photograph as they’re shy and normally keep their distance in flight. They are also terrestrial in their lifestyle, inhabiting tree-less plains and wetlands, hunting close to the ground and nesting and perching on the ground, usually invisible or nearly so in grass or reeds. 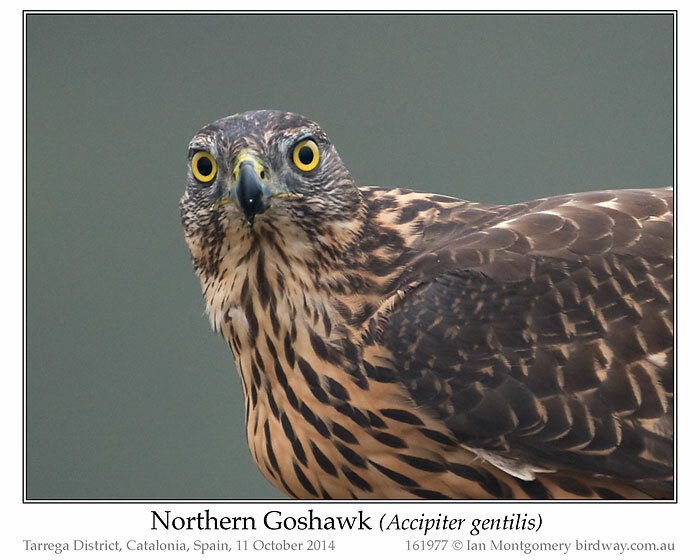 They hunt by flying low over the land or water – quartering – and dropping suddenly to seize surprised prey (sorry, I’ve done it again) such as birds, small mammals and frogs in their long-legged talons. 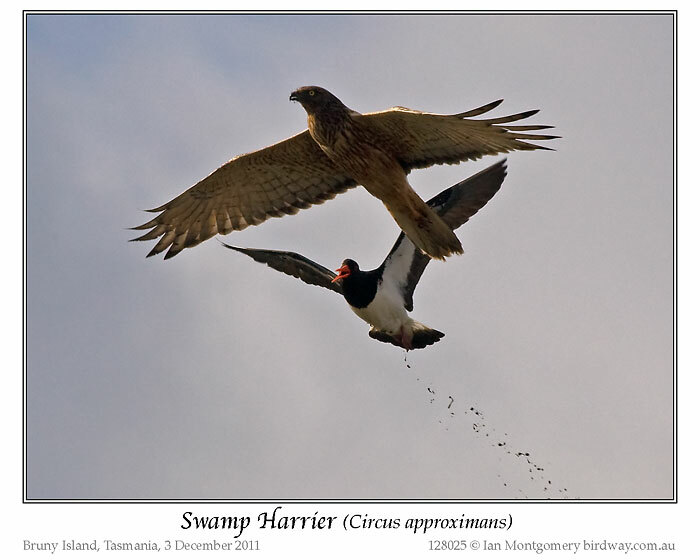 When quartering, they alternate between flapping their wings and gliding with the wings held in a characteristic V, like the bird in the fourth photo in an otherwise tranquil pastoral scene in New Zealand. 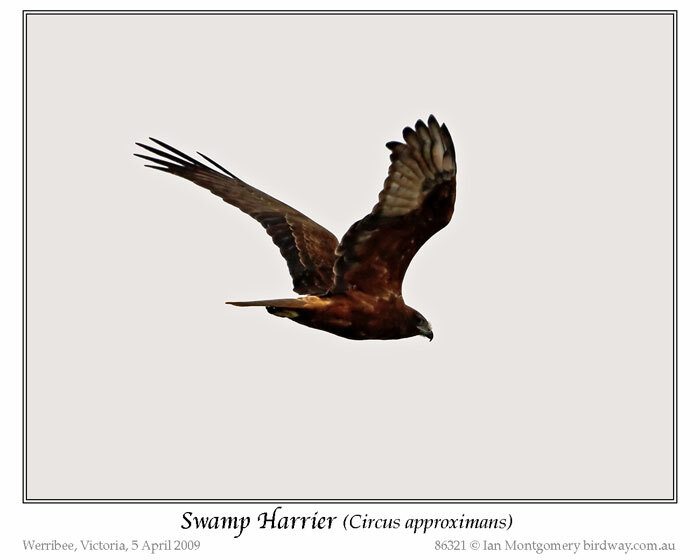 Adult Swamp Harriers are brownish and streaked, with white rumps. 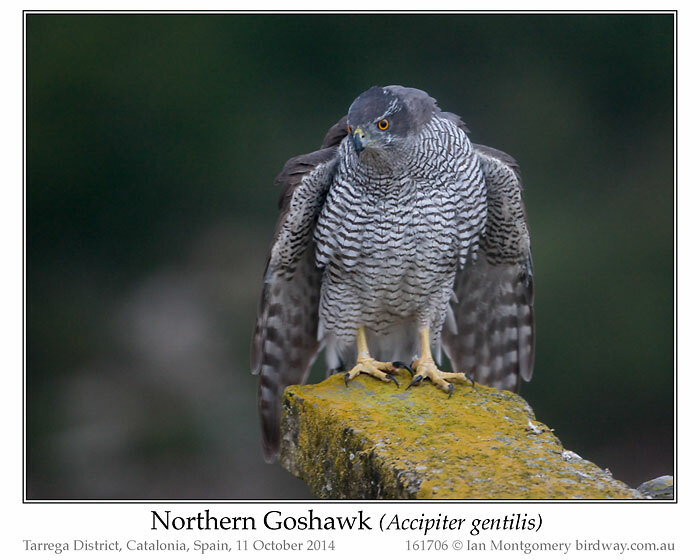 Older males have greyish wings and grey tails, unmarked except for a sub-terminal band. Females are more rufous and have barred tails and both the Bruny Island and New Zealand birds are, I think, males. Juvenile Swamp Harriers look quite different and are rufous brown overall with pale rufous rather than white rumps, like the one in the fifth photo. 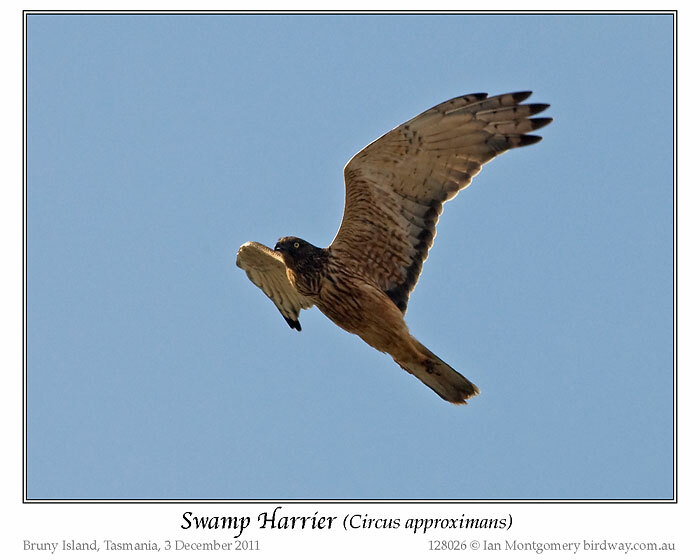 In Australia, Swamp Harriers nest mainly in the south, including Tasmania and migrate north in winter – in North Queensland, we see them only in the winter months. In New Zealand they make local movements across Cook Strait and they turn up on various islands including Lord Howe and Norfolk. 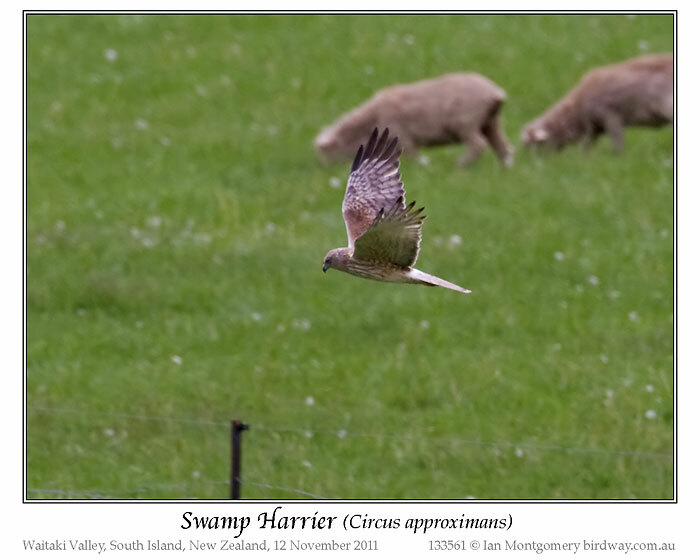 Raptors are poorly represented in New Zealand and the Swamp Harrier is the large bird of the prey, being the only breeding member of the Accipiter family (hawks, eagles, etc. 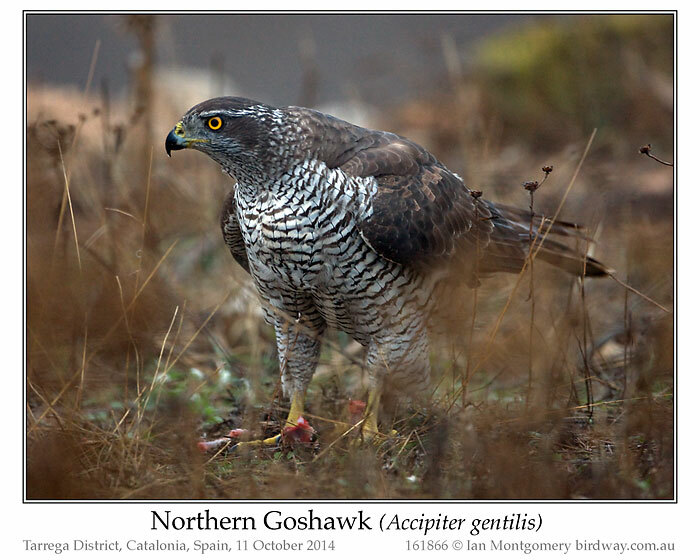 ), with the rarer New Zealand Falcon being the only breeding falcon. 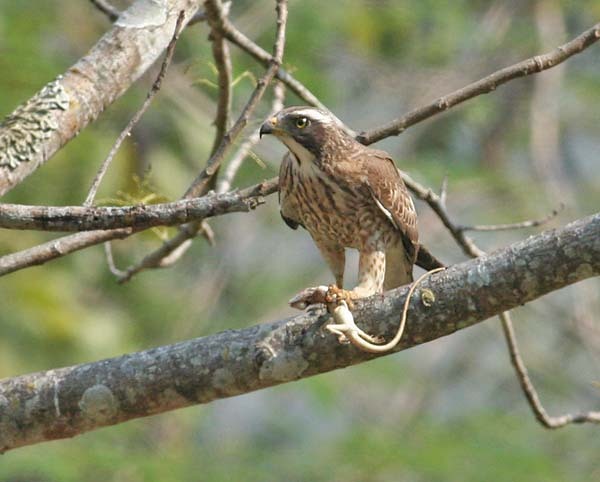 Swamp Harriers also breed in Melanesia and Polynesia as far east as Tonga. 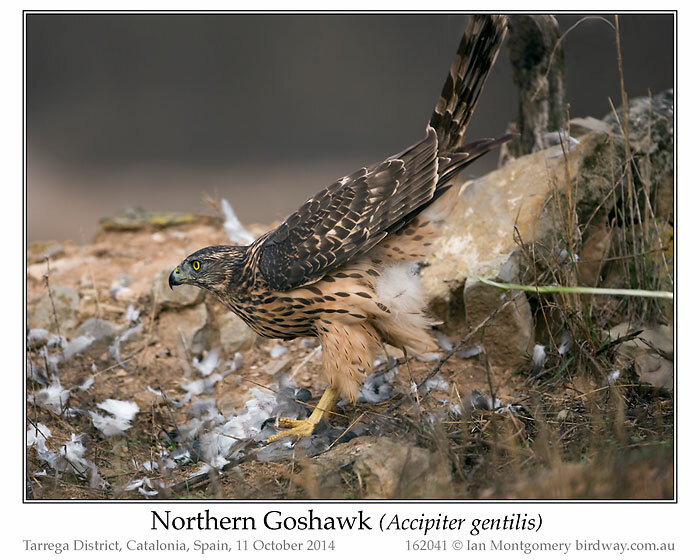 It has close relatives in Eurasia comprising the Eastern, Western, African and Madagascar Marsh Harriers. In this case, the Oystercatcher “drove them away.” You have to admit, that Oystercatcher looks right angry. 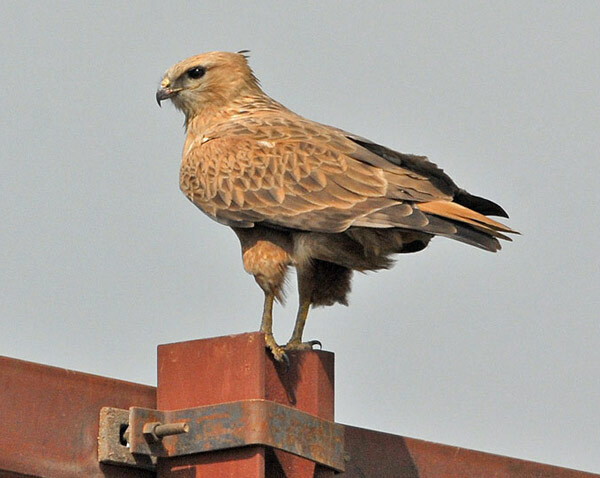 The Swamp Harrier is a member of the Accipitridae – Kites, Hawks & Eagles Family. 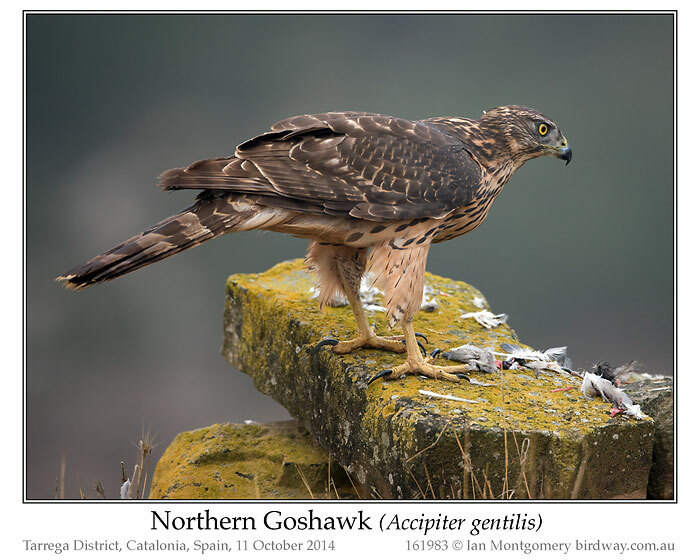 There are 256 species, of which, 17 are Harriers or Harrier-hawks. 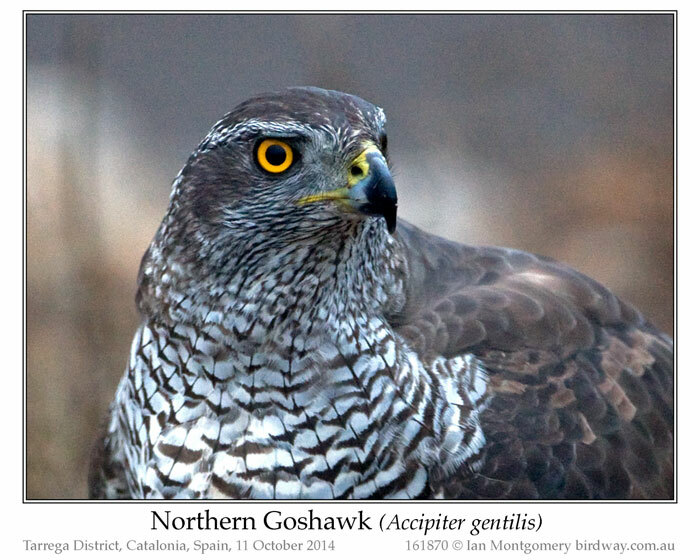 Ian already gave quite a bit of information about this beautiful bird. The diet of the Swamp Harrier is mainly ground birds and waterbirds, rabbits and other small mammals, reptiles, frogs and fish. During the Winter months harriers feed to a large extent on carrion, including roadkill.